At both trade shows Domotex und BAU 2019 FN Neuhofer stood out from the crowd again. Exciting new products were presented professionally to the visitors by the FN team. 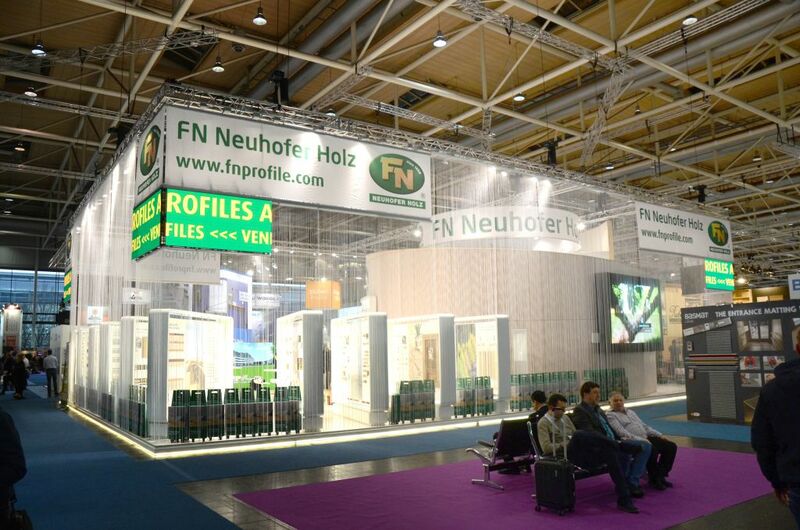 FN Neuhofer is renowned for its innovative strength in product development, which ensured the Austrian family-owned company stood out from the crowd at this year's Domotex and Bau trade fairs. Highlights of the trade fair presentations included FN digi-direct - digital direct printing on skirtings and flooring profiles - as well as the product innovations FN roomy and the plaster-flush profile FN flush-pro. Visitors to the stand were greeted by a range of exciting new products and received expert advice from the FN team. With a total area of 280 m², the large exhibition stand featured all the new products as well as many popular items in the product range. At the centre of the stand was the Innovation Centre where the product highlights and the latest innovations were displayed. This area was for invited guests only, but trade fair visitors who had introduced themselves to one of the FN Neuhofer hostesses and handed over their business card were also allowed to enter. Why go the long way when there is a short cut. With FN digi-direct, you can now print directly on a variety of base materials such as plastics, aluminium and solid wood - without first having to print on paper or veneer, which in turn then has to be glued to the desired surface. This creates a new workflow, allowing for very small batch sizes and short delivery times. This flexibility also applies to profile lengths. The continuous production of the plastic means that customised lengths can also be produced. 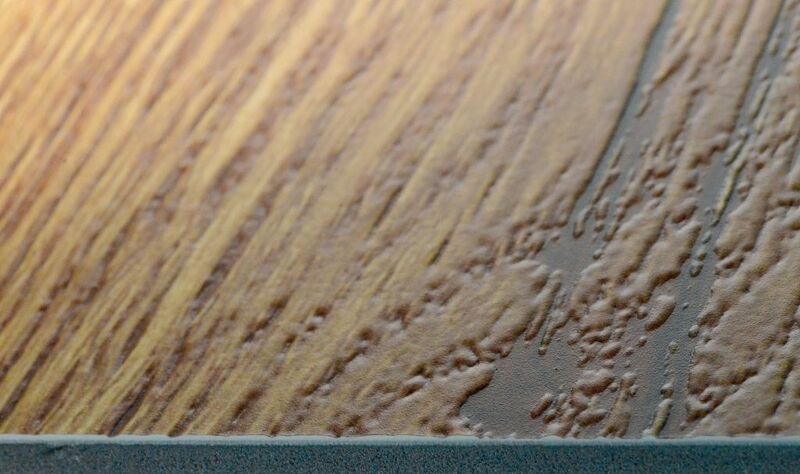 In addition, surfaces can be given a 3D haptic by means of a special process that creates a relief-like surface on skirtings and floor profiles. Our printed plastic and aluminium skirtings and profiles are 100% waterproof. All profiles can easily be installed with FN’s proven fixing systems. FN roomy can do it all – divide rooms, organise, store things. All that with almost no screws. FN roomy consists of system components like beams, boards, joint hangers, connecting elements and attachable accessories that you can configure and assemble based on your needs. Use it as a simple room divider for an apartment, for example, with no need to screw it to the floor, ceiling or wall. That way, you can easily take it with you when you move. Or use it as a single pillar with shelves that serve as a wardrobe element. 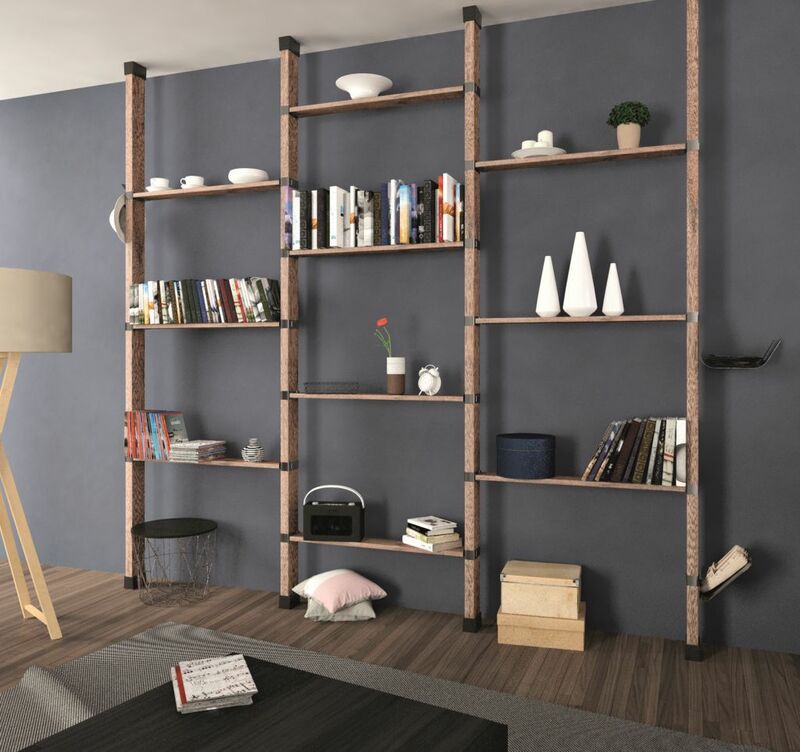 Or keep several pillars against the wall, connected with boards as a shelving unit. To assemble, place the beams into the joint hangers. The hanger is equipped with springs and a pressure plate, which holds the post in place between the floor and ceiling. You do not need any screws to install the post and there is no damage to the floor or ceiling. Next, insert the boards as shelves, either with the elbow connector or a clampable plug system. You can simply attach the corresponding accessory to the clamps. 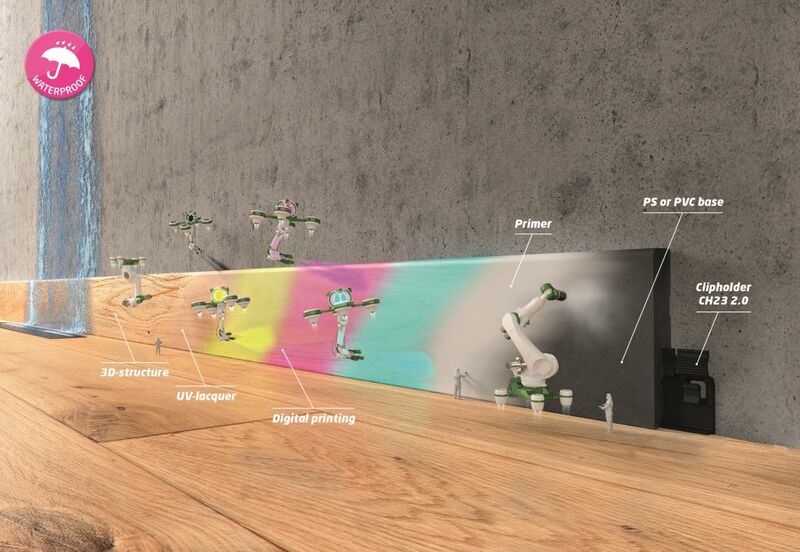 The surface of the beams and boards consists of digitally printed foil, which can be designed individually. The core is finger-jointed spruce. Beams are boards are unfinished, however, so that you can colour them however you want. It is very practical when everything is flush with the wall. You can place your furniture right on the wall and you no longer have to clean the baseboards. The plaster-flush baseboard is the answer. The strip is made of aluminium and is applied before the wall is plastered. After plastering, a hollow space is created in the baseboard area. You can use it for the expansion joint when laying floors. 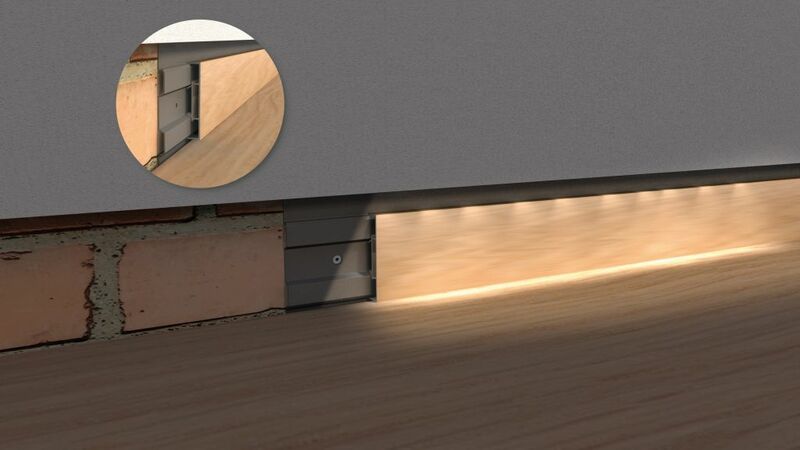 Subsequently, the space can be filled either with a floor section or with two different cover profiles: The one profile covers the entire area from the plaster to the floor, while the other profile has an opening at the lower edge of the plaster, into which you can install a LED strip, for example. The FN product range has been extended to include white lacquered spruce and pine profiles. In addition, we also offer spruce profiles with white covering film, which can be painted over with standard wall paint if required.